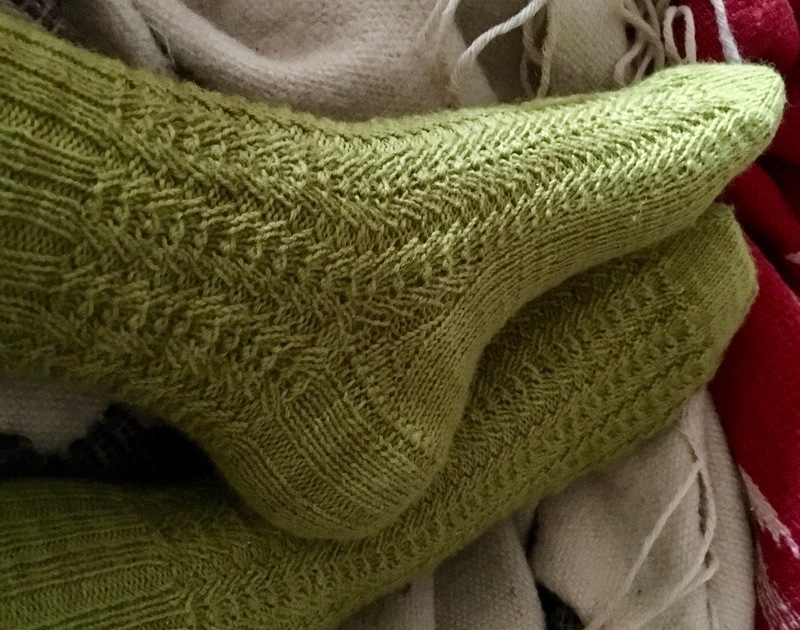 A year and a half ago, I wrote a blog post about a pair of socks I was knitting for myself, talking about my design decisions and how I messed around with a stitch pattern called braid stitch from a stitch dictionary to make it sit correctly on the top of the sock. I knit the first half of the second sock and then other projects became shinier. The braid stitch socks went into hibernation until a couple of weeks ago, when I picked them out of the bin. I need more socks, and the stitch pattern was freshly attractive to me. I finished the second sock last night, and I thought I’d share my conclusions so as not to leave that blog post hanging. First, I still like the way they look — I really like the way the stitch pattern looks when stretched out on the foot. However, the stitch pattern is stiff enough that I really should have increased enough stitches at the toe to put in another 7-stitch repeat. I can get the socks onto my feet, but it’s a close thing. Fortunately, they are not so tight that I can’t wear them comfortably. Or, wait. Now that I look again, I can see that I should have added more gusset stitches to make the heel flap longer. This would have let me add in one more stitch pattern repeat in the cuff, which would have made the socks easier to put on. I think I like this solution better, since it would have solved two problems at once. I should have taken better notes about how I worked the gusset – I think it might be slightly different on the two socks. Something I didn’t mention in the previous post – I didn’t just slap a standard k2p2 ribbing on the cuff. For one thing, it wouldn’t fit nicely in 63 stitches. For another, I like my ribbing to flow out of the stitch pattern that’s being used. One obvious choice would have been k5p2 ribbing, but I wanted something a little stretchier. So I put a purl column above the p3tog part of the stitch pattern, making the ribbing into *k2, p1, k2, p2; work from *. I like the effect. In any case, I have another pair of hand knit socks I like, and that’s always a good thing. I still need more socks, but I’m going to work on destashing some self-patterning yarn. I’m just going to knit plain socks in alternation with my design knitting for a while. I think if you were to start by increasing at the toe to a total of 70 sts, you could put five full repeats of the stitch pattern on the top of the sock, and just work the sweet tomato heel as usual, and then have ten repeats of the stitch pattern around the heel. Assuming that 70 sts would fit your foot properly. The original post, linked from this one, has the stitch pattern instructions. And you can always ask me at String thing! Rounds 1-3: *p1, k5, p1; work from *. Round 4: *p1, LLI, k1, p3tog, k1, RLI, p1; work from *. RLI is a right lifted increase and LLI is a left lifted increase. For this one, they’re not twisted.